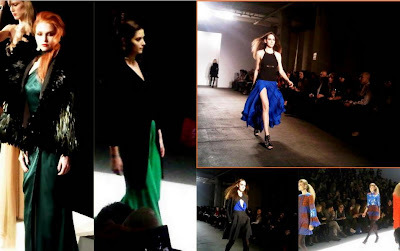 Once Mercedes-Benz Fashion Week happens the thing on everyone's mind is trends, trends, trends! People want to know what the hot new trend for the upcoming season will be that all of the "in the know" fashionistas will be wearing. The funny thing is that by the time that season comes the fashion world has already moved on to the season after that. Right now everyone in the fashion world is gearing up for Mercedes-Benz Fashion Week to show the Spring/Summer 2013 collections in September, but you may be asking, "what the heck am I suppose to wear when Fall 2012 HAPPENS?!" Luckily, you don't have to worry about hunting down what trends were hot on the Fall 2012 runways because I am here to give my OJ&B guys and gals along the rundown when it comes to Fall 2012 trends. Get ready for OJ&B's fashion refresher course along with tips on how to work the looks (don't forget to take notes)! 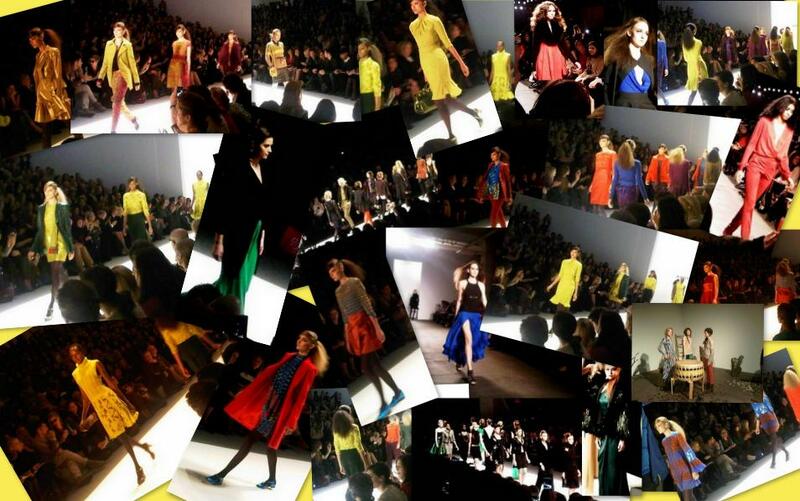 For Fall 2012 I saw so much color that I decided to call the trend "Spring for Fall." I have always loved wearing color all year long and I am so happy that the fashion world is now doing it as well! But what colors were the hottest? Check it out! Fall is all about bright colors (don't be nervous about it) and red, even orange, is a fun way to heat things up in the chilly weather! You can do neon reds, bright reds, deep reds and even maroons and burgundies. What people should note about color is that you can wear them with almost any neutral like brown, khaki, black and grey. I always call those my anchor colors. 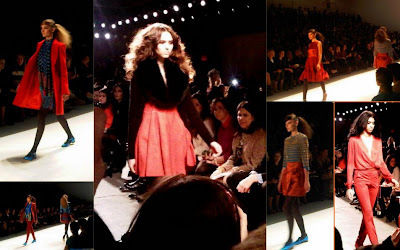 A good example would be the middle photo of the model wearing a black cropped fur (fur was a huge trend as well) with a bright red skirt. If you are really fashion forward and daring you can wear a colorful outfit underneath a bright red jacket like the model on the left. Another option is to keep it chic and classy by wearing all black with a red necklace, bracelet or clutch to add that hot pop of color for your fall wardrobe. See, nothing to be nervous about! Apparently is has to be neon to be on with some of the shades of yellow for Fall 2012. The same things that I said for reds can apply for yellow. Yellow is the perfect way to show your fun and flirty side. I also remember Stacy London, from TLC's What Not To Wear, saying that yellow looks good on every skin tone. 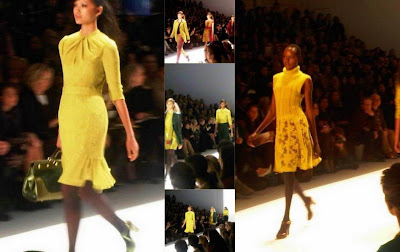 I think that is true as you can see various types of models above rocking yellow. My favorite color combination with yellow is a deep and rich chocolate brown. Can you imagine one of the dresses above covered by a beautiful chocolate brown tench coat? It would look divine! My friend recently bought a yellow clutch (via my strong suggestion) and she has nothing but good things to say about it! She was not a big color person but she says that the clutch is helping her step into the colorful world of well... color! My absolute favorite colors to see coming down the runway are blues and greens. Give me a deep green and blue any day over the other colors (except maybe orange). I think that they can take you the furthest especially if you are just dipping your toes into color. Black with pops of royal blue are a great way to make a dramatic entrance. Emerald or kelly green are great with black as well. My favorite usage of blue has to be the model on the bottom. She has an all black outfit on with a pop of blue in the middle. That is what I love to do with my outfits; have my anchor color and then add that POP of color! I hope that I have helped refresh your memory about what was seen direct from the MBFW Fall 2012 runways! Also remember that florals were happening along with fur as I mentioned before. Color for fall happened to be my favorite trend and I am excited that I got to share it with you! Feel free to include your tips on how to rock color in the comment section below! BONUS TIP: The great thing about this "Spring for Fall" trend is that you can use a lot of your spring pieces in the fall with a great coat and creative layering. By doing that you just might have some extra money in the budget to do that thing you love and we LOVE THAT! Be sure to check back on OJ&b for more fab fashion tips and fun stories as we gear up for the Spring/Summer 2013 collections September 6th - 13th!